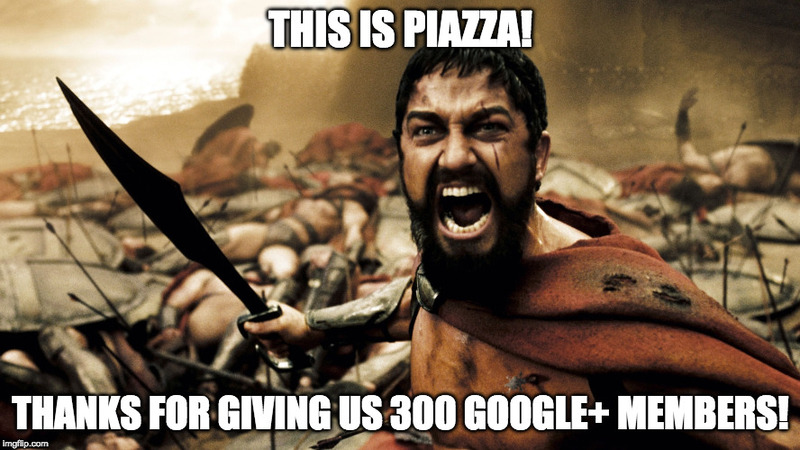 Google+: The Piazza has an official Google+ community here: The Piazza Google+ page. Skype: The Piazza does not have an official Skype presence, and there are currently no plans to acquire such an account. Twitter: The Piazza does not have an official Twitter presence, and there are currently no plans to acquire such an account. Youtube: The Piazza does not have an official Youtube presence, and there are currently no plans to acquire such an account. Other RPG forums: As Ashtagon, I maintain an active presence on Giant in the Playground. I also have a less-used account on Enworld. In the event of server downtime, announcements will be made on Facebook. If this becomes extended, admins who have accounts on other forums will post forum status updates on other gaming sites. If you wish to report server downtime, please do so on Facebook, and note the time and date of the event, including which time zone of city you are in. Please don't try to convert time zones "to be helpful" when doing this, as daylight savings time varies in different regions in often-confusing ways. Your local city, date, and time will be fine. If you want to post your own social media contact details, feel free to do so in this thread. However, please be aware that this thread is publicly visible, so only post details that you actually want to be publicly visible. There are options to add ICQ, AOL IM, MSN, Yahoo IM, Jabber, and personal website contact details to your profile on this website. In addition, you can send an IM within the forum interface to give out personal contact details. We do not advise posting personal email addresses on any forum in a publicly visible space. Dragonquetra: Gaming (All types but predominantly table-top with a tighter focus on TTRPGs). Eldritch Secrets: Movies, Music, Tv Shows and anything else entertainment related. Last edited by Angel Tarragon on Sat Apr 20, 2019 7:13 pm, edited 76 times in total. Last edited by Knightfall on Wed Oct 07, 2015 11:24 pm, edited 1 time in total. The Facebook page for The Piazza now has 596 likes! "Feeling brave tonight? How brave? 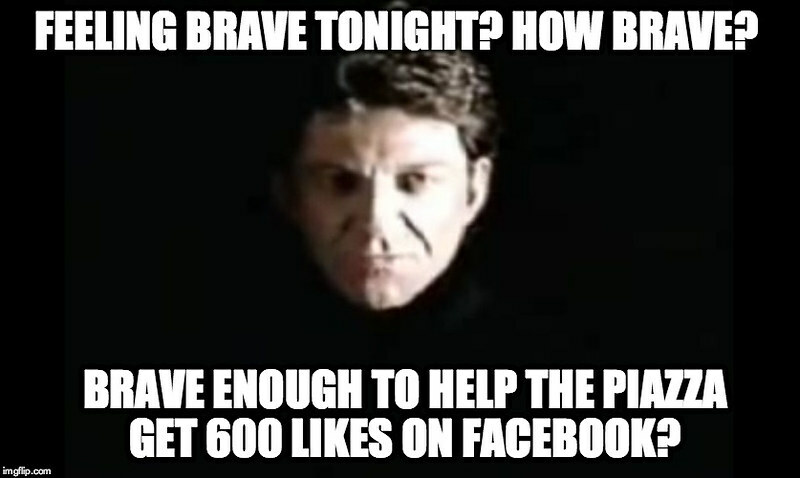 Brave enough to help The Piazza get 600 likes on Facebook?" 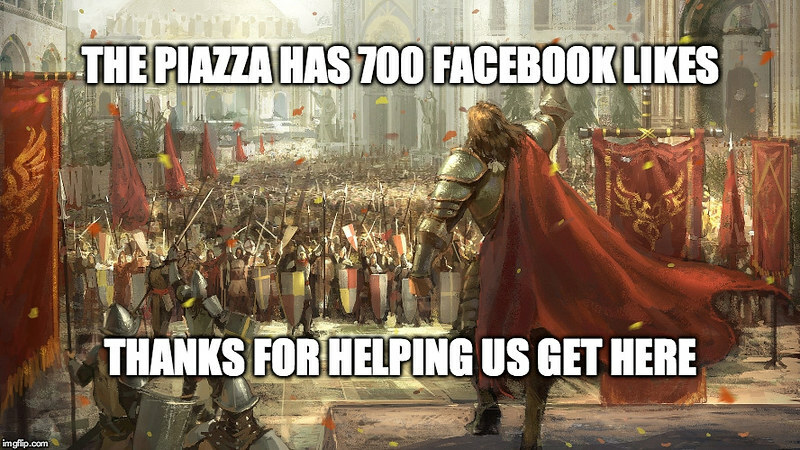 The Facebook page for The Piazza now has more than 700 likes! EDIT: Blimus! The Piazza is up to 741 likes! Somebody must be inviting lots of Dungeons & Dragons fans that have not heard of The Piazza before! Does anyone else have some friends they could invite? Do you think we could get up to 800 in one day? I've seen a few people add their social media details, and I've had a few people hunt me down, so I thought I'd add a post about me, why I'm on the social media and who I want to meet. I'm primarily on Facebook. I went there to look for Spelljammer fans. I later started to search for fans of other D&D settings* (although that's more of a passive search than an active one). ** = Or help people on different social media sites team up here and build enough of a community to allow for a request for a custom forum. Please do not add me to any Facebook groups unless we have a conversation on Facebook and I tell you that I want to be added to the group. If you think I would like a group, please PM me a link to it or drop the link on my Facebook page. If you dump me into a group without asking me, I will just leave it. Sending out a ton of friend requests to beg for money for Kickstarter promotions looks pretty scuzzy. There are a lot of people on social media who are now considering this to be spam. If you have a Kickstarter banner on your page when you send me a friend request, I'm going to suspect that you are trying to misuse our potential friendship as a way to use my social media account as an advertising platform. If you have a Kickstarter to announce, I would suggest you start a topic over in The Wishing Well. If you live in London (or occasionally visit London) do let me know. Maybe we can meet up at some point. Here's a summary of my online presence as far as games are concerned. Some of these (like my blog and my current campaigns) are linked in my signature as well. The Facebook page for The Piazza now has more than 1300 likes! Thanks for all the extra love on the social media. timemrick wrote: Here's a summary of my online presence as far as games are concerned. Some of these (like my blog and my current campaigns) are linked in my signature as well. I recenlty posted a shorter version of my list (with a short blurb about each link) to my blog as "Finding Me Online." Last edited by Havard on Thu Oct 18, 2018 4:17 pm, edited 2 times in total. Being that G+ is being re-purposed, I highly recommend that The Piazza establish a community on the MeWe social media platform. From what I can see, having a page (as opposed to a person-based account; conceptually similar to FB's page concept) would cost USD24 annually. While I can respect that mewe has to make its money somehow, The Piazza is run on a very tight budget, and realistically, I don't think this is a good way to spend that money. I found a service called WhereToFind.me, which allows you to grab a username and then post links to your various social media accounts, blogs, forums, etc. I'll try to remember to keep it updated in the future, so I only need to provide a single URL.